Josh Marchand, a student in the Entertainment Arts and Engineering Masters program at the University of Utah, has been accepted to a position at Epic Games as a UX Researcher Intern. He is the first EAE student to get a UX research position. "I use playtests, data and analysis to ensure that the development team's vision is being fulfilled with the players. I have wanted to make games as a career since I was 14 years old. EAE gave me the guidance I needed to fulfill my aspirations of being a game developer. They were the first people--outside of my family--that gave me the push to make my dreams a reality. 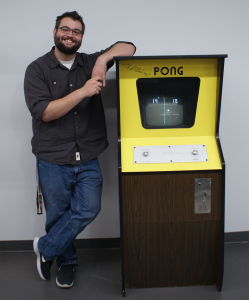 It was because of Ashley Brown's Games User Research and Experience class that I learned specifically what I wanted to do in the industry and EAE has helped me every step of the way to make that possible." Josh will be starting his internship this summer.